Man has dreamed of flying for hundreds of years. The artist da Vinci drew a flying machine in 1490; in 1889, R.J. Spalding patented a bird suit to help him fly; and in 1906, Traian Vuia built an "aeroplane automobile" that hopped. Learn about early aviators including the Wright brothers, William Christmas and Bessie Coleman, etc. Read about the thrill of flying with barnstormers, wing walkers, Charles Lindbergh and the New York City Air Police. Mary has been a volunteer docent for the American History Museum of the Smithsonian since 1980 and for the National Archives since 2004. She is a member of the Fairfax County History Commission. Her interest in local history has found an outlet through writing articles and speaking to community groups. She became interested in aviation when her elementary school teacher wheeled a television into the classroom to watch astronaut Alan Shephard's first flight. 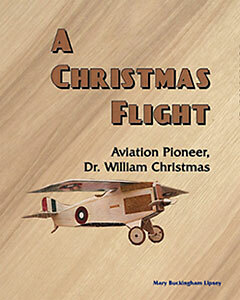 Dr. William Wallace Whitney Christmas was the third American to successfully fly a powered, heavier-than-air craft! He did so on March 8, 1908 in the Virginia countryside just west of Washington, DC. A Christmas Flight is the first-ever biography about the talented, yet now forgotten, man who made many important contributions to aviation. Dr. Christmas invented inset ailerons, which are still used over 100 years later on nearly every modern aircraft. His contemporaries included the Wright brothers and Glenn Curtiss. He built his first plane in secret on a farm in Fairfax County, VA, then moved his operations to College Park Airfield in Maryland, and later established a factory on Long Island, NY. A gifted inventor, Dr. Christmas was awarded his first patent, one of many, at age 18. He also designed an underground airport and a flying hotel. In addition to endnotes and an index, A Christmas Flight has 60 illustrations, 3 maps, an appendix of his aviation-related patents, and a timeline listing the aeronautical accomplishments of Dr. Christmas alongside those of Dr. S.P. Langley and the Wright brothers. 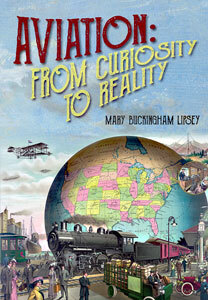 Mary Buckingham Lipsey is co-author of Braddocks True Gold: 20th Century Life in the Heart of Fairfax County. She taught 7th grade history for 30 years. Ms. Lipsey has volunteered at the National Archives, Washington, DC, since 2004 and at the National Museum of American History since 1980. 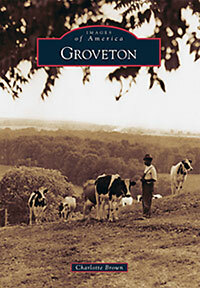 Groveton is located in Fairfax County, three miles south of Alexandria on what is now known as Richmond Highway. The original property owners of the Groveton area were George Mason, Sampson Darrell, and George Washington. Early family homes that are still standing include Huntley, Stone Mansion, Wilkinson, Sherwood Farm, and Briery Farm. Between the 1880s and early 1900s, Groveton was home to several orchards and farms. Dairy farms, such as Clifton, Groveton, Sherwood, and Hybla Valley Farms, made up the Alexandria Milk Association for which Groveton was known. By the mid-1900s, the farms gave way to businesses, churches, residential housing, and two airfields. Today, Groveton has grown to become a diverse neighborhood and is experiencing economic growth due to the Fort Belvoir expansion. • Rarely seen images of the original 1876 Groveton Schoolhouse, 1925 and 1933 elementary school and the 1956 high school. • Information on Historic Huntley, which was built on property purchased by George Mason, author of The Bill of Rights, and served as a summer home to his grandson. • Images and information about the first Fairfax County Police Department substation located in Groveton and the 1942 Penn-Daw Volunteer Fire Department. • Vintage images of early businesses, churches, highways and rural scenes. Local historian and author Charlotte Brown grew up in Groveton and has documented St. Mark’s Episcopal Church history and researched area family history and genealogy. Using photographs carefully preserved by Groveton families, the author, with the help of Historic Huntley House supporters, family, friends, and neighbors, was able to capture this history of Groveton. Retired from Securities and Exchange Commission, Brown lives in her childhood home in Groveton and with her sister, Bonnie. She enjoys gardening and is active with the Groveton Civic Association. Proceeds from Groveton go to support the Friends of Historic Huntley. The 1805 Diary of the Rev. 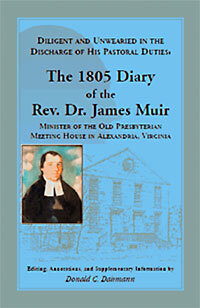 Dr. James Muir, Minister of the Old Presbyterian Meeting House in Alexandria, Virginia. Diligent and Unwearied in the Discharge of His Pastoral Duties features an annotated transcription of the Rev. Dr. James Muir’s personal diary from 1805. Muir was born in Ayrshire, Scotland in 1757, and died at Alexandria in 1820, serving the Old Presbyterian Meeting House congregation from 1789 to 1820. He received his formal education from the universities at Glasgow and Edinburgh. He published some fifty sermons, a periodical, and a critique of Thomas Paine’s The Age of Reason. In addition to serving a large urban congregation, this personal friend of George Washington was also involved in establishing Alexandria’s Society for the Promotion of Useful Knowledge, Alexandria Library Company, Washington Society, Board of Guardians of the Free Schools, the Bible Society of the District of Columbia, and in championing the cause of equal justice for Americans of African descent. George Washington attended services conducted by Rev. Muir; they regularly corresponded; and Muir presided at Alexandria’s memorial services for Washington in 1799 and 1800. Reverand Muir’s account of a single year reveals the personal routines and interactions of the minister of a prominent urban congregation; provides his reactions to numerous notable contemporary events; and his accounts of journeys to Presbyterian and Congregational assemblies, and to preach and visit in Baltimore, Philadelphia, New York City, Connecticut and elsewhere. 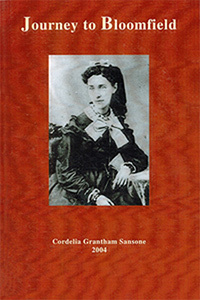 The diary is enhanced by extensive annotations that provide information on over 100 contemporaries; a biography of Rev. Muir; a list of his publications; a list of the Bible texts on which he based that year’s sermons; a description of Alexandria in 1805; and a history of the Old Presbyterian Meeting House congregation. The original diary is at the Library of Virginia. by Carole L. Herrick © 2011, pp. 126, photos and illustrations. McLean was a farming community in 1910, when Henry Alonzo Storm established a general store that included the McLean Post Office; the opening of Storm’s Store is considered McLean’s unofficial beginning. The store was located on Chain Bridge Road beside a stop on the Great Falls and Old Dominion Railroad, an electrified trolley that ran from Rosslyn to Great Falls Park. 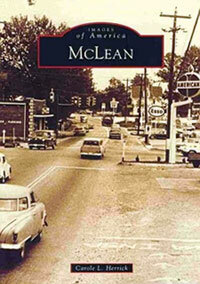 The stop was named after John R. McLean, a founder of the trolley and owner of the Washington Post newspaper. A village and vibrant community gradually developed around Storm’s Store. by Carole L. Herrick © 2007, pp. 487, photos, illustrations, and index. This book is a collection of 100 recollections. 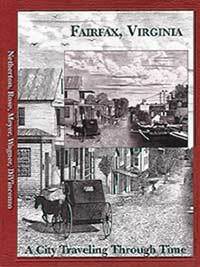 It is a broad overview of two communities, McLean and Great Falls (formerly Forestville), Virginia as told by those who lived there. Their stories are all different and yet, when put together collectively, they portray a rural life-style that is rapidly disappearing, not only in Northern Virginia, but across America. 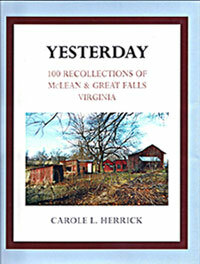 by Carole L. Herrick, pp. 363, photos, illustrations, and index. 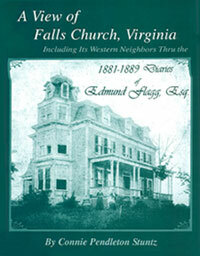 This book is a continuation of a broad collection of the memories of two communities, McLean and Great Falls (formerly Forestville), Virginia, as viewed through the eyes of many who laid the foundations for the generations who followed. Everyone has a story, and each one is different. Nothing is more valuable to a community than preserving its past history through the recollections of those who took part in it. by Carole L. Herrick © 2005, pp. 249, photos, illustrations, and index. 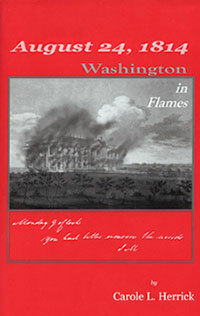 This is the story of the British invasion and burning of the capital of the United States, including a lengthy account of the flights of Dolley and James Madison into the surrounding countryside. America's new capital built along the Potomac River in the middle of swampland and forests seemed to many as an unlikely target for an enemy invasion. They were wrong. Even though there were warnings of an impending attack, the government was unprepared for the disaster of August 24, 1814.
by Carole L. Herrick © 2012, pp. 398, photos, illustrations, and index. 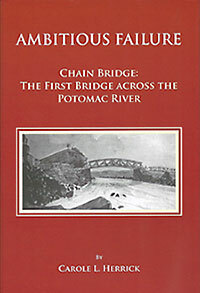 The first bridge that spanned the Potomac River was a wooden toll bridge built in 1797 just below Little Falls, the Potomac’s head of navigation. Over the decades eight bridges have spanned the river at that site. It was the third bridge, a chain suspension bridge, from which Chain Bridge received its name. The Little Falls location was selected because the river is very narrow at that point. Georgetown merchants were hopeful that the bridge would divert Virginia’s inland trade away from their commercial competitor, Alexandria, and the farmers and planters would bring their goods into Georgetown. by Nan Netherton, Ruth Preston Rose, David L. Meyer, Peggy Talbot Wagner, & Mary Elizabeth Cawley DiVincenzo © 1997, pp. 227, illus., index. For ordering information, call the Fairfax Museum & Visitor Center at 703-385-8414 or toll-free at 1-800-545-7950 .
by William Page Johnson, II © 1995, pp. 249, index. or call 703-273-6130 to order. by William Page Johnson, II © 2002, pp.460, index. A comprehensive look at Virginia participation in the Mexican War consisting of a history, muster rolls, and biographical information on each participant. Click Here for Don's Web Site Bookstore. 113 pages, illustrations, notes, and index. A study of Civil War veterans from Schuylkill County, Pennsylvania, and the GAR (Grand Army of the Republic) post they organized in 1879. It contains information on GAR membership, rituals, and activities as well as facts on the pension laws and process to obtain a pension. by Cordelia Grantham Sansone © 2004, pp. 242, index; Reprinted 2012. Add $6.00 for the first book or $8 for up to two copies. To avoid shipping fees, copies are available at the Virginia Room of the Fairfax City Regional Library at 10306 North Street, Fairfax, VA 22030. If you would like a copy held there for you, call 703-293-6227 and punch 6. All proceeds from the book will be used to purchase Civil War materials relating to the Confederacy for the Virginia Room collection. by Richard E. Crouch © 1994, pp. 58, illus. 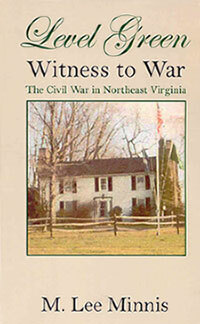 All available material about Loudoun County Virginia's own Confederate partisan leader, and surely its most feared and hated Civil War figure, has been collected in this publication. 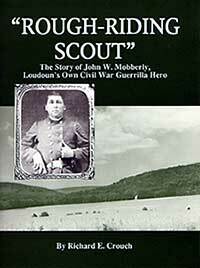 John W. Mobberly was the leader of an extremely dangerous band of uniformed ruffians that operated in the western half of Loudoun County, and nearby Maryland and West Virginia, during the latter half of the War Between the States. Mobberly earned a unique reputation for vicious, savage, ruthless butchery. 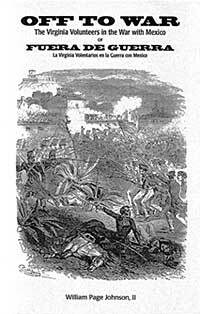 His comrade wrote that Mobberly personally killed more Yankees than any man in Lee's whole army. He has been a figure of mystery to local residents and historians for many years, and it has long been difficult to separate the fiction from the fact. This study attempts to do just that. Virginia Residents add 4.5% sales tax. by Richard E. Crouch © 1999, pp. 152, illus. A complete history filled with quotable quotes and recyclable anecdotes, this book includes everything you need to know about this vanishing species. He who would be a gentleman or survive as one will find instructive stories here. This little volume abounds in helpful hints on how the gentleman deals with boors and braggarts, parvenus and poachers, ladies, Yankees, horses and hospitality, ancestry and alcohol, inheritance of plantations and titles. 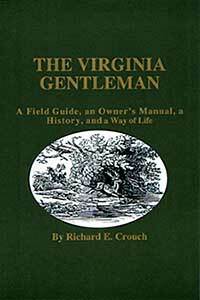 Nature’s gentlemen and the improvident and impecunious gentleman are covered, as well as how ladies manage the best ol’ boys and occasionally vice versa, and who really holds the power in Virginia. Add $2.75 for one copy or $3.20 for 2 copies. by Richard E. Crouch © 2002, pp. 296, illus., 6x9, cloth, index. 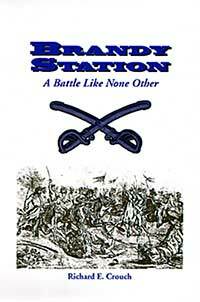 Brandy Station was a battle like none other. Cavalry against cavalry, with close to 10,000 horsemen on each side, much of it was fought with sabers alone. This comprehensive but fast-moving study of the great mounted struggle near Culpeper, Virginia, on June 9th of 1863 brings to life that story with all the epic sweep of a great narrative. It includes much material that has long been out of print, and much manuscript material published here for the first time. The story of the largest cavalry engagement ever fought on the American continent includes the experiences of large numbers of individual soldiers and civilians who witnessed, participated, and lived through that extraordinary day. 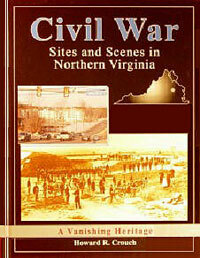 In addition to a straightforward telling of the battles dramatic story without semiotics or deconstruction, this book includes the setting, the causes and effects of the battle, the little-known role of the infantry, the commentary in both Civil War and modern times, and the long-range effect on the futures and fortunes of the Union and Confederate Cavalry. Also covered are the role of spies and intelligence operatives, the controversy over failures of the scapegoated subordinate commanders, the unseemly excuse-making of the leaders, and a detailed look at the official reports. Including Its Western Neighbors Thru the 1881-1889 Diaries of Edmund Flagg, Esq. by Connie Pendleton Stuntz © 2005, hardbound, 206 pages, 130 illustrations, and index. features descriptions of 18th century plantations in the area. Virginia Residents add $1.75 sales tax. by M. Lee Minnis © 2006, pp. 284, 47 illus. Level Green was built in 1728 by Richard Omohundro and continues to be occupied after two hundred and seventy eight years. It has seen many joyous events as well as trials and tribulations. Not the least of the latter was its part in the Civil War for both sides. Its history is one of people, ghosts, and adventure. Add $2.50 for the first book and $1.00 for each additional book. 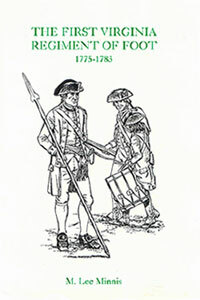 This is the first history of any Virginia Regiment in the American Revolution. Battles and daily actions are recorded chronologically followed by biographical data on many of its members. It is extremely helpful to historians and genealogists. Three of its colonels later became governors of Virginia. by Margaret C. Peck © 2004, pp. 128, illus. 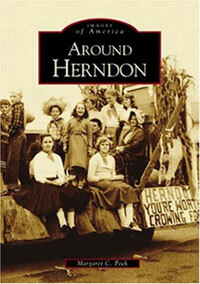 The town of Herndon is situated on the western edge of Virginia's picturesque Fairfax County. In the 18th and early 19th centuries, this part of Fairfax County was primarily agricultural, and as additional settlers arrived farming flourished. Early residents found woods, flat open fields, outcroppings of rocks, and workable soil throughout the region. By 1857, the installation of the railroad line brought summer residents, commuters, and real estate developers to the area. Residential growth continued into the 20th century, as more Washington, D.C. workers chose Herndon as a convenient town from which they could commute to their jobs. From 1959 to 1961, the railroad line experienced busy years when it was used to haul sand and construction materials to build neighboring Dulles Airport, which opened in 1962. Although the region has become a center of Internet technology, with several high tech companies located in the area, Herndon still retains a small-town charm. 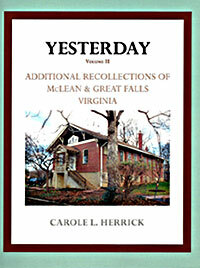 Available new from Arcadia Publishing and new or used from Amazon.com. by Margaret C. Peck © 2005, pp. 128, illus. 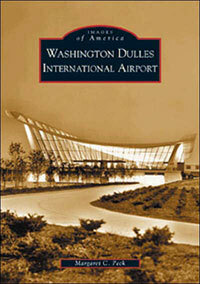 Washington Dulles International Airport is one of the three major airports that transports passengers into and out of the Washington, D.C., metropolitan area. The beauty of the site is admired not only by millions who arrive and leave the area, but by local residents as well. After an extensive study of three separate locations in Virginia, Pres. Dwight D. Eisenhower agreed to the Chantilly site and later chose to rename the world’s first jet airport after his former secretary of state, John Foster Dulles. Renowned architect Eero Saarinen designed the magnificent building that serves as a gateway in and out of the United States. Today, the once peaceful farming area and small villages have turned into a fast-paced business world filled with thousands of new homes and residents. by Ken Kryvoruka © 2006, 108 pages, illus. 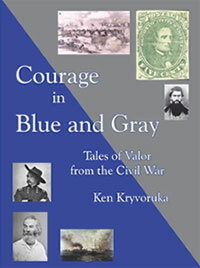 This is a rich sampling of Civil War stories – tales of courage and valor – culled from letters, diaries, newspapers, periodicals, battle reports and pamphlets, which feature some well known and not so well known people who faced danger and uncertainty and showed great courage throughout this difficult time in our nation’s history. Here, in vivid detail and with a dramatic flair, are the voices of soldiers and sailors, friends and enemies, doctors, correspondents, generals and politicians, all told in a way that only history from the heart can tell. These tales convey the vitality, the humor, the courage and the valor of a people and their volatile era. Available new from AuthorHouse and new or used from Amazon.com or Barnes and Noble. 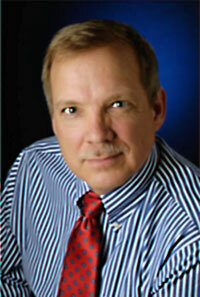 Click Here for the author's Web Site. 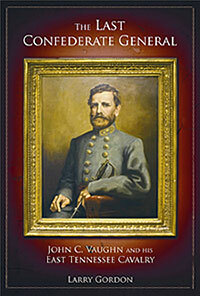 John C. Vaughn and his East Tennesseans fought at First Manassas, Vicksburg, and all over Tennessee, Virginia, and Maryland. In continuous action from the beginning to the end of the Civil War, he escorted Jefferson Davis in the war’s final days and was the last general in the eastern theater to surrender. Larry Gordon presents the life and times of this often-maligned Rebel cavalry leader who was blamed for losing the upper Shenandoah Valley at the Battle of Piedmont. He makes use of new research and information to reveal a complete picture of General Vaughn, including the effects on his performance of General William T. Sherman’s arrest and incarceration of his wife and family. Signed/personalized copies from the author are only $24.95 plus S&H: (Add $2.50 for the first book and $1.00 for each additional book. Virginia residents also add 5% sales tax, or $1.25/book). 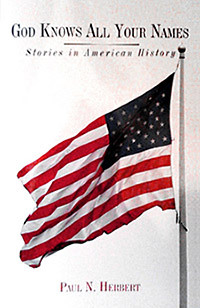 This is a collection of 60 short stories in American history dealing with a wide range of topics. 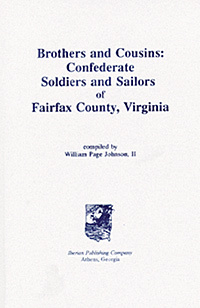 The topics are obscure and unusual, such as a story about President's Lincoln's personal bank records, a plot to kidnap George Washington, the impeachment of a Supreme Court justice, corruption in the Civil War, a history of the Lee Highway and the Little River Turnpike, indentured servants, World War One posters and a slave insurrection in Fairfax County that never quite got off the ground. There are also stories about the Revolutionary War draft in Virginia, the Revolutionary War lottery and ships that collided (including in the Potomac River) during the Civil War. And much more! by Patricia Strat ©2010, pp. 240, illus. 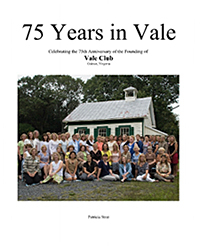 "75 Years in Vale" uses historic photographs and writings, as well as modern narratives and memories, to tell the story of Vale Club, a women's group in Oakton, Virginia, which was established in 1934. The Club, which began as a Home Demonstration Club affiliated with Virginia Polytechnic Institute's Extension Service, has been in continuous operation since its founding. Last Revised August 2, 2018.